Conservation Service hours will be applied to the service requirements for Star and Life. You may now finalize attendance for shifts similar to how you finalize attendance for events. Determine which shifts will add to service hours for community service or conservation service. Don't award credit until attendance is finalized. A new option allows you to control when credit for participating in troop activities will be recognized. 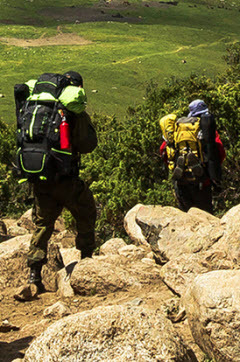 National Outdoor Awards reports for each segment: Camping, Hiking, Aquatics, Conservation, Riding and Adventure. 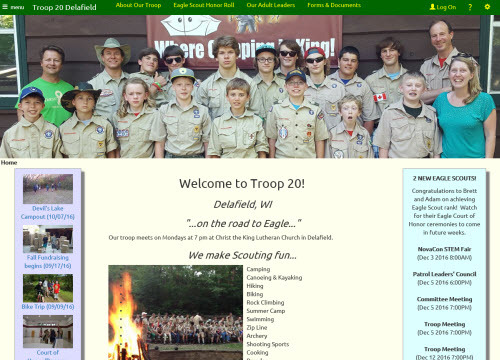 Troop 20 of Delafield, Wisconsin! Just looking at the facial expressions in the page-width photo at the top of their home page you feel like you already know these guys! We like how they've used background colors and shadows on their sidebar sections to make them stand out. The photo collage in the lower portion of the home page is a nice touch, too!